In 2019, Foundation Todos Juntos will no longer support Pop Wuj's Safe Stove Project. Please contact Pop Wuj directly for more information. The Pop Wuj Safe Stove Project is a joint endeavor between Pop Wuj and various communities surrounding Xela to facilitate the construction of safe household stoves to replace open fires in the homes. Our twist on the traditional Guatemalan plancha stove design allows us to integrate the important elements of public health promotion, environmental protection, financial welfare and cultural appropriateness into a relatively inexpensive, durable and easy-to-construct stove. Foreign volunteers and Guatemalan professionals work in concert with local families and community leaders to build safe stoves and address short- and long-term issues facing the community. 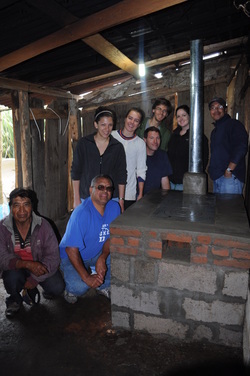 More than just building stoves, the project fosters a sense of common purpose among members of the Mayan communities as they coordinate, organize and collaborate as a community and, in addition, provides a unique opportunity for foreign volunteers to learn about and interact with members of a very different and interesting culture. As global environmental problems such as deforestation and climate change increase in severity worldwide, safe stoves are a tangible step towards developing and implementing appropriate technologies that can benefit the people and the environment alike. Our modified plancha design was conceived by Mynor Arrivillaga, a Guatemalan engineer with over twenty years of experience designing and constructing safe stoves in Guatemalan communities. The modifications to the traditional plancha design increase combustion and heat transfer efficiency, thereby producing a safer, more environmentally-friendly and fuel-efficient stove. Combustion Efficiency – Clay and pumice insulate the combustion chamber, causing the fire to burn more combustible gases and produce less smoke. The brick ramp increases the speed of airflow within the combustion chamber, reducing harmful emissions, and conducting smoke into the chimney, which then channels the smoke out of the house. Heat Transfer Efficiency – The brick ramp decreases the size of the combustion chamber, reducing the distance the hot air must travel to heat the cooking surface. The removable concentric rings ensure that the maximum surface area of each pot will be exposed to the fire. Health – Illnesses contracted from smoke inhalation are currently the second leading cause of death among children in Guatemala and have become a serious issue for adults, who run increased risks of contracting major respiratory conditions. Safe stoves also significantly reduce the risk of major burns from open fires, which are typically constructed in or around living spaces. Environmental – Improved stoves promote a healthy environment by requiring half the firewood as an open fire to produce an equal amount of heat. As a result, more trees are left standing and fewer harmful pollutants are released into the atmosphere. Financial – As the rate of deforestation grows, so does the price of firewood. Many families spend over half of their income on firewood alone. The safe stoves we build are approximately 70% more efficient than open fires, thus saving families both the time required to collect firewood and the money necessary to buy it. Volunteering – Pop Wuj Spanish Language students are the project's short-term volunteers. Long-term internships are available for individuals who have a minimum of intermediate Spanish and can make a three-month commitment. Interns are screened and selected via Pop Wuj's partnership with Entremundos, a Xela NGO. Please visit Entremundos for more details and to apply for the Environmental Projects Coordinator position. Donations – Each stove costs approximately $160 to construct. Consequently, monetary donations are a crucial part of keeping this project alive and are sincerely appreciated.